What is common to all these daily activities? The answer: buildings. Buildings are not only the largest physical element in cities, occupying 50 percent or more of urban land area, but are also where people spend most of their time, as the average person in a developed country spends up to 90 percent of his or her life in buildings. However, buildings are often ignored as public service providers, despite their prevalence in urban life. As a result, investments in buildings often lag, leaving significant potential untapped for improving productivity, health, and comfort. It’s time for leaders from both the public and private sectors to pay attention to buildings as a way of improving how their cities perform. Performance is a measure of how effectively and efficiently services are provided. Buildings with low performance—like poor indoor air quality or high operating costs due to inefficient energy or water use—can be detrimental to not only to the economy of a city, but the health and productivity of the people who use them. Self-sufficiency: high performing buildings can be resilient to disruptions in the electricity and water supply. Alternative infrastructure services: on-site water management can avoid the need for larger municipal water treatment infrastructure, and mitigate flood risk. Positive community impact: buildings can not only be self-sufficient, but also act as alternative suppliers of energy and other services. Selling water, power, and other services to the community can help pay for the investments needed in technology and maintenance. Buildings have the potential to be one of the most disruptive, game-changing city service strategies of the 21st century. But city leaders need to act, using public policy catalyze private investment and improve performance. Efficient and on-site technologies with integrated design – Buildings are increasingly adopting a variety of technologies—from light-emitting diodes (LEDs) to solar photovoltaics—thanks to dramatically decreasing costs. These technologies, combined with best practices in building design and operations, mean that better buildings are possible and increasingly affordable. New business and finance models – Market innovators are using business models like energy service performance contracts and power purchase agreements for rooftop solar panels to improve management practices and make advanced technologies affordable. New regulatory and leadership models – New policies are addressing longstanding market failures—like imperfect information. Building performance disclosure policies are providing better data for urban decision makers to assess how buildings perform across sectors. This is happening in cities like Philadelphia and dozens more. By requiring “tune-ups” to buildings, as in New York, policy makers can ensure that owners, who are not technical experts in building science, make cost-effective improvements to how their buildings operate. Many others are setting building performance targets to motivate action and improve public accountability. 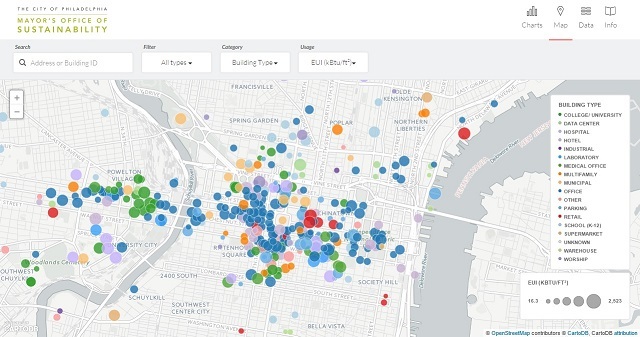 A benchmarking map of Philadelphia that allows decision makers and property owners to identify how buildings are performing, and take action to make individual buildings more efficient. Map by City of Philadelphia, Mayor’s Office of Sustainability. Radically rethinking how buildings provide services—and the kinds of services that buildings can provide—is a tremendous opportunity for improving city performance. Accelerating these emerging trends and catalyzing change at a greater level will not only benefit building owners and users, but cities as a whole. It’s time for public and private sector leaders to recognize these benefits and act.